Been wondering what I have been up too? Well, probably not, but as I am still alive and squirreled away in my study, I thought an update might well be of some interest. 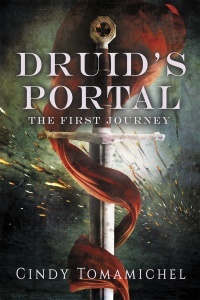 Druid’s Portal: The First Journey has reached the magical target of ten Amazon reviews, which is lovely and much appreciated. In some exciting news, I have a Goodreads giveaway running this month, so if you are on Goodreads, click on this link, and sign up for the chance to win a paperback! Of course, you are welcome to buy it anyway if you are not willing to wait. 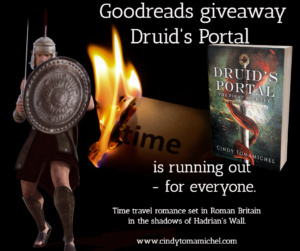 Druid’s Portal: The Second Journey is currently with my lovely Soul Mate Publishing Editor Sharon Roe, and I hope that it will get published before the end of the year. It follows the next generation into the time portal, and events set in motion in the first cause havoc in the second. I have delved into a lot of alternate history, and characters that Janet and Trajan met have had some quite different lives. Druid’s Portal :The Third Journey will wrap up the series. I am researching it now, and it is full on action and adventure, using several key historical events and people. Anthology: In other writing projects, I have a short story coming out (July 27) in “Tales from an Alternate Earth 2”. It is a collection of short stories focusing on alternate history, and mine ‘The Dust in the Kings Library’ is a twist on King George and his use of toxic cosmetics. I highly recommend the first Alternate Earths collection as well. Click here to check it out. Short story collections: I am going to release my short stories on an unsuspecting world. If you enjoy scifi, or speculative fiction or romance, there will be something I hope will be of interest. These are being edited at the moment, but I expect to have them done by the end of the year. So lots of things to look forward too, and quite a few projects to keep me busy!